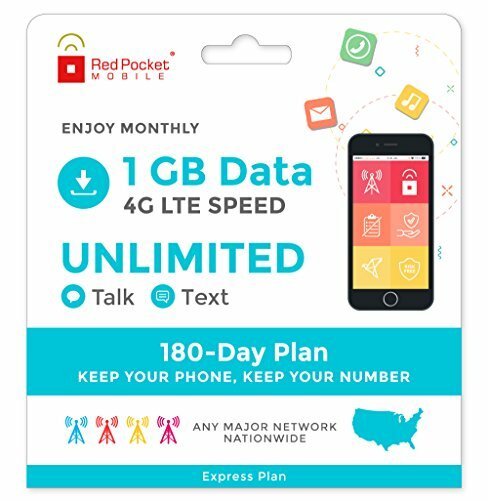 The Red Pocket Mobile 180 Day Express Plan provides 6 months of Unlimited Talk(domestic & international to 70+ countries), Text (domestic & international), and 1 GB LTE Data on your choice of the nation's top four wireless networks. You get high-quality nationwide coverage with lightning fast LTE data speeds on this top-rated, easy to use plan (if your phone is LTE-capable, of course). Setup is easy for virtually ANY cell phone that works in the USA. Are you looking to use this awesome plan, but in need of more data? Check out our 180 Day Premium Plan that includes 3GB of LTE Data! Are you looking to save even more money? Check out our Annual Express Plan - pay for 9 months and get 3 months FREE! This amazing plan also comes with an optional FREE sim kit. The sim kit includes the following items: One universal GSMA sim - This sim can be used with any AT&T device or unlocked GSM device One universal CDMA sim - This sim can be used with any non-Sprint CDMA LTE device One dual GSMT sim (Classic/Micro) - This sim can be used with any T-Mobile device or unlocked GSM devicej Your activation code will be sent within one business day of your order completion via Amazon messaging. If you have not received your activation code within 1 business day please send us a message via Amazon messaging ASAP with your order confirmation number.